This month was incredibly busy and blessed with back to back teams and workshops working together with us to build God’s kingdom here in Tonj. 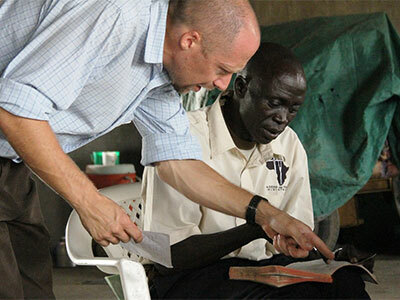 Mango Ministries facilitated the training to more than 30 pastors and leaders on how to use Bible storytelling to bring the gospel to churches and communities. This included the five churches we planted and the two new churches planted in the last 2 months. Each participant was sent home with 12 stories to learn and share. It is so awesome to see the fruit from the three years of Bible training our pastors received and to see them pouring out their lives to serve the Lord through church planting and preaching. Mary, an STS participant, has been using the story of Mary and Martha to encourage the local women of her village. Many women are too busy working, getting water etc. to attend church. After hearing Mary share the Bible story, Mary said “many were awoken spiritually and began coming to church and they are asking me for more stories”. Mary has a vision to share the Bible through storying with any woman she meets, whether they are gathering firewood or collecting water from the well near her house. 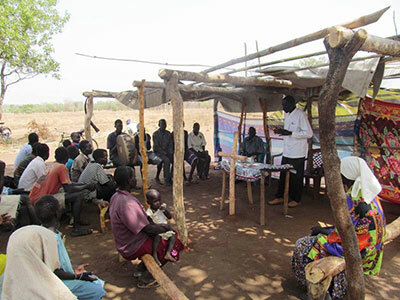 It is our joy to see the church of South Sudan healthier spiritually than we have ever experienced it, maturing in faith and seeing these healthy churches teaching the truth of God’s Word and the saints growing and walking in that truth. This month we also graduated the first class for our Training of Trainers for the Community Health Evangelism (CHE) program. This program is having a huge impact on the communities represented by the trainers. The leaders are being transformed before our eyes through the truth of God’s Word. Topics of discussion have been about sin issues, trusting the work of the Lord Jesus on the cross and depending on the Holy Spirit for true conviction, repentance and change. The last workshop implemented the teaching of Farming God’s Way as a tool to help communities maximize their harvest. Families live and depend on the land for all their food needs for an entire year, so this teaching was valuable and possibly life-saving to them as we still experience a one month food gap every year following the devastating famine of 1998. Our hope is knowing the Lord Jesus came to give life abundant. Two new churches have recently been planted in another area of Warrap state by one of our graduated pastors called Pasquale. One of those churches was planted in the village of Rebobi. Our partner, Every Village, has been drilling bore holes in the Tonj area based on our recommendations. Rebobi village had a three hour walk to the nearest water source and was a perfect candidate for an Every Village water pump. Pastor Pasquale met with the community and shared the Lord’s provision for water with them. After the borehole was drilled Pastor Pasquale called the villagers together for a time of thanksgiving and praise and gave all thanks and glory to God for His answer to prayer and provision for Rebobi. The villagers enjoyed the time of praise and prayer and Pasquale noted they did not have a place to worship the Lord. So he announced that a church would meet every Sunday for those interested in worshipping the Lord together and that’s how the church was planted. These churches really need your prayers. Pastor Pasquale already pastors a church of 100 + people so he appointed an elder from his church to lead one of the church plants. The other church is still in need of a leader. For spiritually strong leaders for the seven churches planted in the last year. For the completion of Agum’s adoption and a visa. For Sabet as he travels and for Suzy as she remains in Africa.